Havana Castle is built upon the enthusiasm and common bond we have for cigars with our customers and friends. 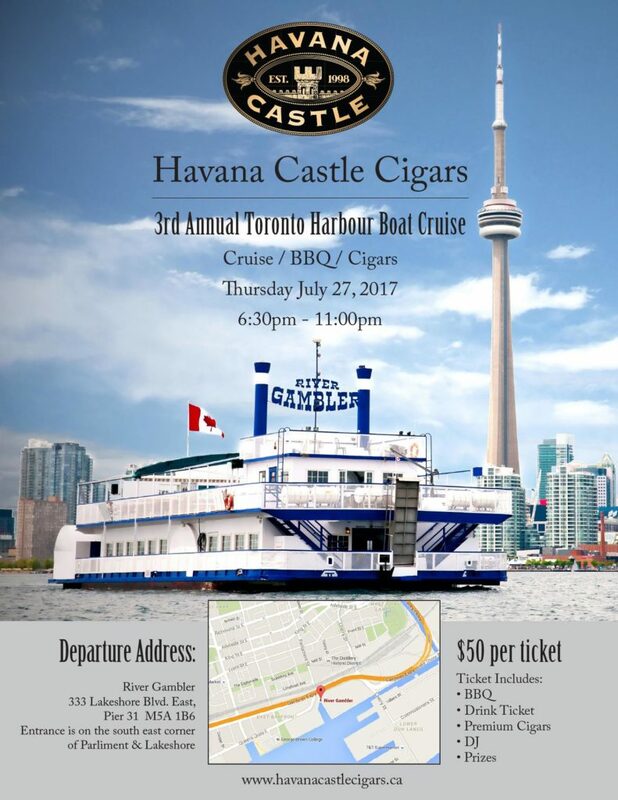 The Havana Castle Boat Cruise embodies all the love of cigars aficionados and beginners share. The cruise allows for an intimate gathering of like minded people from all over to discuss and share their cigar enjoying experiences. The River Gambler has been cruising the shores of Toronto for over 30 years. We recent upgrades, the venue is the perfect setting for a true Lake Ontario experience brightened by the city lights of Toronto. On each cruise there are three fully certified officers and our entire crew is trained in marine emergency duties in accordance with Transport Canada regulations. Additionally, our officers are trained in marine first aid and CPR. The dynamic crew has only one mission: to accommodate your event planning needs by providing the absolute best service, fully-customizable with dozens of party options!